What happens when I’m tired but I’m hungry and yet I have a metric ton of salad greens from the market in my fridge? I made this a few weeks ago and decided this was a good time to make it again. I once thought that only “salad vegetables” could go on a salad. I never thought bacon, eggs, and nuts could taste so good over greens. This might be due to my discovery that I love eggs over sauteed garlic spinach. That is my new favorite quick meal. This one was even more flavorful due to toasted walnuts and dijon dressing. As far as the tomato, I am out of my roasted cherry tomatoes from last summer. I cannot stand the texture of raw or regular canned tomatoes. So I added some tomato juice to the dressing. Place nuts in a small skillet; cook over medium-high heat 3 minutes or until lightly browned, shaking pan frequently. Remove from heat; set aside. Break 1 egg into each of 4 (6-ounce) custard cups coated with butter. Cover with plastic wrap, and microwave at high for 1 minute or until set; let stand 1 minute. Remove eggs from cups; drain on paper towels. Cook bacon in a skillet over medium-high heat until crisp; cool slightly. Remove bacon from the pan, reserving 1 teaspoon drippings. Crumble bacon. 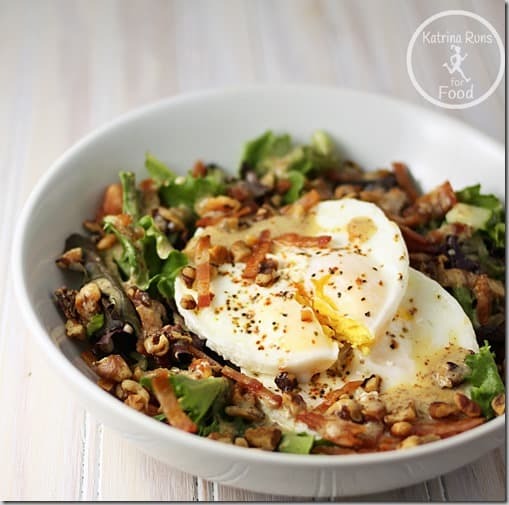 Combine walnuts, bacon, and greens in a large bowl. Looks delicious! I love runny eggs on salads for every meal. I am new to the eggs on salads thing, but I definitely like it!